BOSTON, MA (April 30, 2013) – Brightcove Inc. (Nasdaq: BCOV), a leading global provider of cloud content services, today announced financial results for the quarter ended March 31, 2013. "We are pleased that Brightcove delivered first quarter revenue and profitability that exceeded our guidance," said David Mendels, Chief Executive Officer of Brightcove. "The rapid shift of consumers watching digital content across a growing array of devices is forcing companies across a wide range of industries to think more strategically about their digital content delivery needs. We believe Brightcove is uniquely positioned to benefit from this long-term trend, and our focus is on continuing to drive the pace of innovation in the multi-billion dollar online video platform market." Revenue: Total revenue for the first quarter of 2013 was $24.7 million, an increase of 24% compared to $19.9 million for the first quarter of 2012. Subscription and support revenue was $23.8 million, an increase of 26% compared with $18.8 million for the first quarter of 2012. Professional services and other revenue was $944,000, compared to $1.1 million for the first quarter of 2012. Gross Profit: Gross profit for the first quarter of 2013 was $16.3 million, compared to $13.6 million for the first quarter of 2012, and gross margin was 66% for the first quarter of 2013. 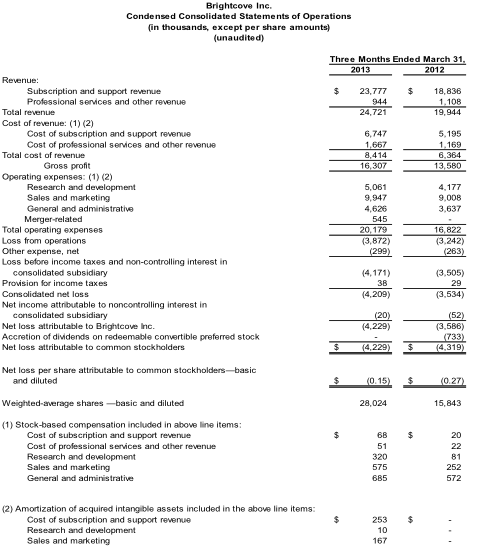 Non-GAAP gross profit for the first quarter of 2013 was $16.7 million, representing a year-over-year increase of 22% and a non-GAAP gross margin of 67%. Operating Loss: Loss from operations was $3.9 million for the first quarter of 2013, compared to a loss of $3.2 million for the first quarter of 2012. 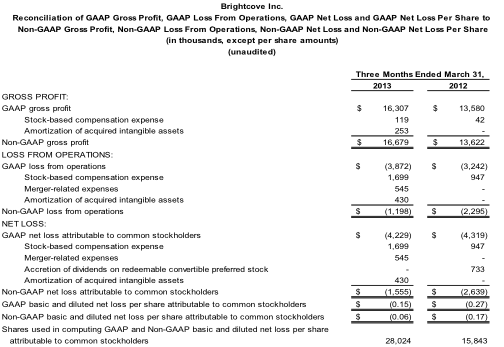 Non-GAAP loss from operations, which excludes stock-based compensation expense, the amortization of acquired intangible assets and merger-related expenses, was $1.2 million for the first quarter of 2013, an improvement compared to a non-GAAP loss of $2.3 million during the first quarter of 2012. Net Loss: Net loss attributable to common stockholders was $4.2 million, or $0.15 per basic and diluted share, for the first quarter of 2013. This compares to a net loss attributable to common stockholders of $4.3 million, or $0.27 per basic and diluted share, for the first quarter of 2012. Non-GAAP net loss attributable to common stockholders, which excludes stock-based compensation expense, the amortization of acquired intangible assets, merger-related expenses, and the accretion of dividends on redeemable convertible preferred stock, was $1.6 million for the first quarter of 2013, or $0.06 per basic and diluted share, compared to a non-GAAP net loss attributable to common stockholders of $2.6 million for the first quarter of 2012, or $0.17 per basic and diluted share. 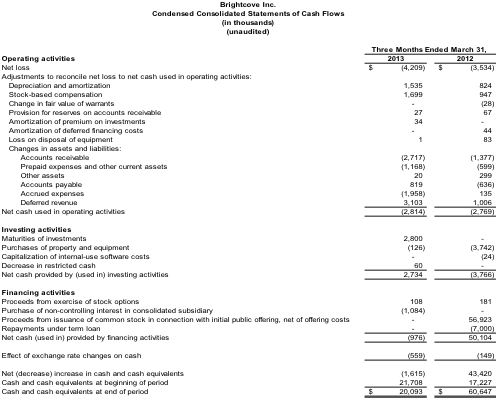 Balance Sheet and Cash Flow: As of March 31, 2013, Brightcove had $28.6 million of cash, cash equivalents and investments, compared to $33.0 million at December 31, 2012. Brightcove used $2.8 million in cash from operations and invested $126,000 in capital expenditures, leading to free cash flow of ($2.9) million for the first quarter of 2013. 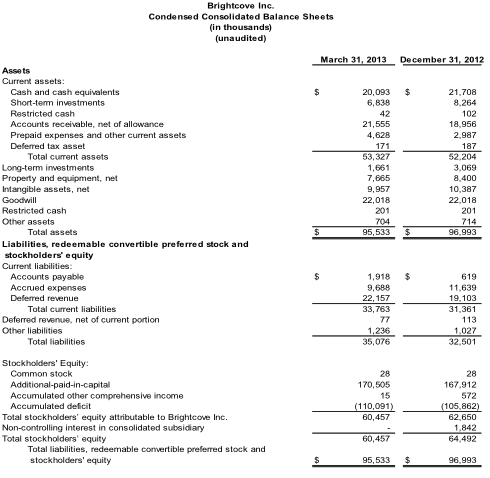 Free cash flow was ($6.5) million for the first quarter of 2012. Ended the quarter with 6,321 customers, which included a net increase of 65 premium customers. New customers added during the quarter included: Network Ten, the Wall Street Journal, Ford Direct, Wesleyan University, and Shutterfly. Announced the general availability of a comprehensive monetization solution for HTML5 video, which includes support for VAST-compliant pre-, mid- and post roll advertising, a new HTML5 video player API that enables dynamic changes to ad policy settings, and HTML5 video plug-in support for leading ad servers from FreeWheel, Google, Videoplaza, and YuMe. Introduced new native player software development kits (SDKs) for Apple iOS and Google Android devices that are integrated with industry leading advertising, analytics and digital rights management providers to provide for improved content performance and successful video monetization. Announced the general availability of Zencoder Live Cloud Transcoding, an open API that enables live video encoding in the cloud and allows content providers to instantly scale live encoding resources without having to invest in on-premise hardware. Rovio Entertainment, the Finland based entertainment media company known for its creation of the Angry Birds franchise, selected Brightcove Video Cloud to support the launch of its Angry Birds Toons animated series. Angry Birds fans will now be able to watch the on-demand series on their smart TVs, smartphones and tablets. Announced enhanced support for TV Everywhere authentication through robust integrations with Adobe Pass and Akamai’s Sola Vision Identity Services. This will enable cross-device authenticated video experiences for both web and native mobile applications, making it easier for broadcasters to provide greater access to premium video programming. Second Quarter 2013*: The Company expects revenue to be $25.7 million to $26.2 million, and non-GAAP loss from operations to be $1.4 million to $1.7 million. Assuming approximately 28.2 million shares outstanding, Brightcove expects its non-GAAP net loss per basic and diluted share attributable to common stockholders to be $0.06 to $0.07. Full Year 2013*: The Company is raising its 2013 financial guidance for revenue and non-GAAP loss from operations. Revenue is expected to be $104 million to $106 million, and non-GAAP loss from operations is expected to be $3.3 million to $4.8 million. Assuming approximately 28.4 million shares outstanding, Brightcove expects its non-GAAP net loss per basic and diluted share attributable to common stockholders to be $0.15 to $0.22. *With respect to the Company’s expectations under “Business Outlook” above, the Company has not reconciled non-GAAP loss from operations or non-GAAP net loss per share attributable to common stockholders to GAAP loss from operations and GAAP net loss per share attributable to common stockholders, respectively, because the Company does not provide guidance for stock-based compensation expense, merger-related expenses, or amortization of acquired intangible assets, which are reconciling items between those Non-GAAP and GAAP measures. As the items that impact GAAP loss from operations and GAAP net loss per share attributable to common stockholders are out of the Company’s control and/or cannot be reasonably predicted, the Company is unable to provide such guidance. Accordingly, a reconciliation to GAAP loss from operations and GAAP net loss per share attributable to common stockholders is not available without unreasonable effort. Brightcove will host a conference call today, April 30, 2013, at 5:00 p.m. (Eastern Time) to discuss the Company's financial results and current business outlook. To access the call, dial 877-705-6003 (domestic) or 201-493-6725 (international). A replay of this conference call will be available for a limited time at 877-870-5176 (domestic) or 858-384-5517 (international). The replay conference ID is 411142. A replay of the webcast will also be available for a limited time at http://investor.brightcove.com. Brightcove Inc. (NASDAQ: BCOV), a leading global provider of cloud content services, offers a family of products used to publish and distribute the world's professional digital media. The company's products include Video Cloud, the market-leading online video platform and Zencoder, a leading cloud-based media processing service and HTML5 video player technology provider. Brightcove has more than 6,300 customers in over 60 countries that rely on Brightcove cloud content services to build and operate media experiences across PCs, smartphones, tablets and connected TVs. For more information, visit http://www.brightcove.com. This press release includes certain “forward-looking statements" within the meaning of the Private Securities Litigation Reform Act of 1995, including statements concerning our financial guidance for the second fiscal quarter of 2013 and the full year of 2013, our position to execute on our growth strategy, and our ability to expand our leadership position. These forward-looking statements include, but are not limited to, plans, objectives, expectations and intentions and other statements contained in this press release that are not historical facts and statements identified by words such as "expects," "anticipates," "intends," "plans," "believes," "seeks," "estimates" or words of similar meaning. These forward-looking statements reflect our current views about our plans, intentions, expectations, strategies and prospects, which are based on the information currently available to us and on assumptions we have made. Although we believe that our plans, intentions, expectations, strategies and prospects as reflected in or suggested by those forward-looking statements are reasonable, we can give no assurance that the plans, intentions, expectations or strategies will be attained or achieved. Furthermore, actual results may differ materially from those described in the forward-looking statements and will be affected by a variety of risks and factors that are beyond our control including, without limitation, risks associated with our history of losses, our limited operating history; expectations regarding the widespread adoption of customer demand for our Video Cloud and Zencoder products; our ability to expand the sales of our products to customers located outside the U.S., keeping up with the rapid technological change required to remain competitive in our industry, our ability to retain existing customers; our ability to manage our growth effectively and successfully recruit additional highly-qualified personnel; and the price volatility of our common stock, and other risks set forth under the caption "Risk Factors" in the Company’s Annual Report on Form 10-K, as updated by our subsequently filed Quarterly Reports on Form 10-Q and our other SEC filings. We assume no obligation to update any forward-looking statements contained in this document as a result of new information, future events or otherwise.